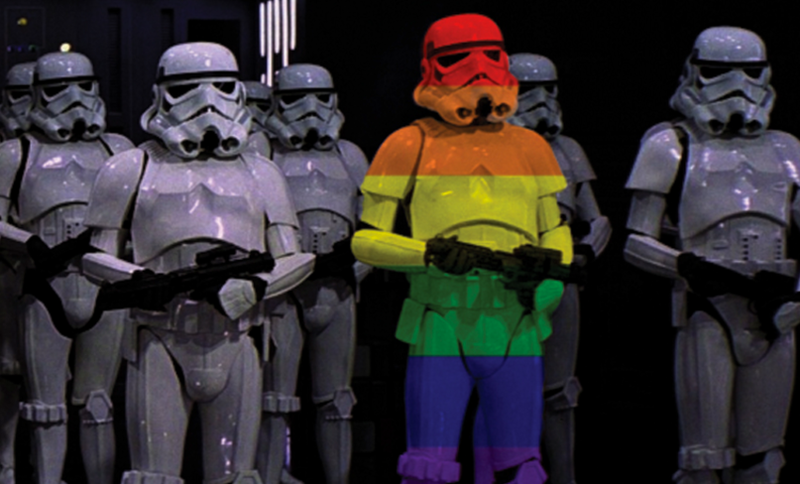 The Gay Almanac: What Will It Take to Get a Gay Character in Star Wars? As the audience rose to applaud at Rogue One’s 2016 world premiere, Joshua Yehl remained in his seat, sobbing so hard his body shook. Yehl had spent a lifetime lining up for Star Wars showings with his best friend Drew Leinonen. But this year, for the first time, he was alone. Leinonen had been shot to death six months prior, one of the 50 victims of Omar Saddiqui Mateen’s brutal attack on an Orlando gay club. After the massacre, Yehl had petitioned Lucasfilm to introduce a gay Star Wars character in tribute to Leinonen. #PutDrewInStarWars amassed nearly 12,000 signatures, an endorsement from Mark Hamill, and extensive global coverage. One journalist invited Yehl to the premiere of Rogue One—where, despite being “an absolute mess of nerves,” Yehl introduced himself to Lucasfilm head Kathleen Kennedy.